Will Germany Supply 450 Armored Troop Carriers to Australia? A German defense contractor will offer the Puma armored infantry fighting vehicle to the Australian Army. The German defense contractor Rheinmetall will offer its Puma armored infantry fighting vehicle, co-developed with Krauss-Maffei Wegmann, to the Australian Army under a A$10 (US$7.1) billion tender for 450 armored personnel carriers. The highest priority for the Army is to replace the ASLAV with a new CRV given that the former will need to be retired by 2020, otherwise a capability gap would ensue. The M113s can remain in service until 2030, although it “is not expected to be deployable for anything other than low intensity/low risk missions beyond 2025.” The Australian Army plans to acquire 225 CRVs and about 450 IFVs and MSVs. The Puma is one of the world’s most advanced and newest IFVs. Developed by Projekt Systems and Management (PSM) consortium, a joint venture of Rheinmetall and Krauss-Maffei Wegmann, the IFV entered service with the German military in June, 2015. Displacing a mere 31.5 tons, the Puma IFV is a medium-weight armored vehicle and can be quickly airlifted into a deployment zone. With its two-level armor protection concept— composite armor with optionally add-on armor elements that can be taken off during air transport—it is specifically designed for expeditionary warfare. According to the PSM website, the IFV “offers high level of off-road maneuverability” comparable with the Leopard 2 main battle tank and can reach a top speed of 70 kilometers (43 miles) on the road. 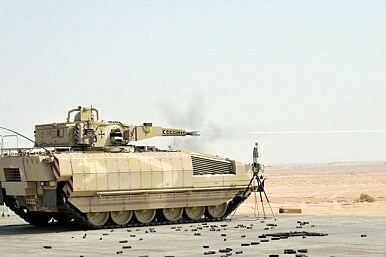 The IFV is armed with a fully stabilized, automatic 30 millimeter MK30-2 ABM (Air Burst Munitions) autocannon with an effective range of 3,000 meters fitted to the remote-controlled turret. It also sports a coaxially mounted 5.56 millimeter HK MG4 machine gun as secondary weapon. In addition, the IFV is equipped with the turret-mounted Missile Weapon System SPIKE, a missile launcher with two missiles allowing “the Puma to fight enemy targets as well as helicopters and threats behind enemy lines even more effectively,” according to the PSM website. The SPIKE missile launcher has an effective range of 4,000 meters. An additional interesting feature of the Puma is its full-length crew compartment for the entire crew, including driver, gunner and commander as well as an infantry squad consisting of six soldiers. “This concept minimizes the volume to be protected, thus the crew protection can be maximized within the existing weight constraint,” PMS explains. Competition for the Land 400 program of the Australian Army will be fierce. “General Dynamics and Lockheed Martin Corp. are expected to team up to offer a vehicle developed for the British Army, while BAE’s Australian arm will offer the CV90, used by a number of European countries,” the website Army Recognition reports. In 2013, Rheinmetall won a $1.5 billion contract to supply 2,500 trucks to the Australian Defense Force. Australia has been using hacker units to go on the offensive. But is its cyber policy up to snuff?